The 16-mile Appoquinimink River meanders through farmlands and wetlands in southern New Castle County, draining 47 square miles. The headwater drains mostly agricultural lands, and feeds four major ponds. The tidal freshwater segment of the Appoquinimink is bound by the head of tide at Noxontown Pond and Silver Lake, and by Drawyers Creek's confluence with the Appoquinimink. 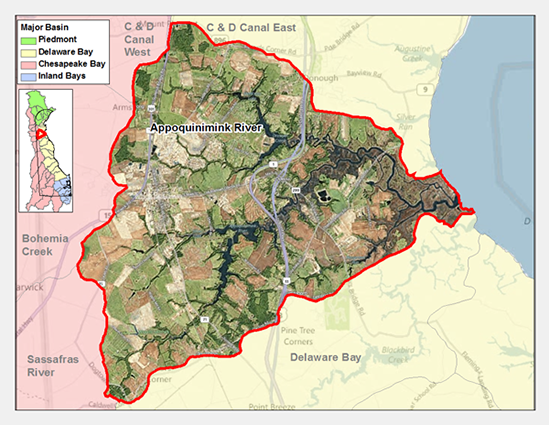 The remainder of the watershed consists of a tidal marsh extending to the Delaware River. The Appoquinimink River system consists of five main tributaries, the Appoquinimink River main stem, Deep Creek, Dove Nest, Hangman's Run, and Drawyer Creek. There are several shallow, man-made small lakes and ponds in the watershed: Wiggins Mill Pond, Noxontown Pond, Silver Lake, and Shallcross Lake. The Appoquinimink River is tidal from the confluence with Delaware Bay to the dam at Noxontown Lake on the main stem, the dam at Silver Lake on Deep Creek, and the confluence with Drawyer Creek. Salinity intrusion from Delaware Bay typically reaches upstream past the Drawyer Creek confluence at river kilometer (Rkm) 8.5. Much of the watershed is actively cultivated; however, as development spreads south of the Chesapeake and Delaware Canal, these farmlands are converting into suburban residential developments. The Appoquinimink watershed, which includes the towns of Odessa, Townsend and Middletown, is one of the fastest growing areas in the state. 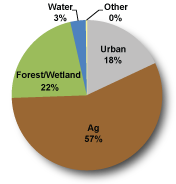 Less than 9% of the watershed remains forested, dominated by oak, hickory, pine, and species common to southern floodplain and mixed forest assemblages. Most forested areas are located along the stream valley, and very few large continuous tracts of un-fragmented forest remain in the watershed. Impervious cover can reveal the extent and pattern of growth in the watershed. In 1992, watershed impervious cover was estimated to be 4%, but grew to 9% in 2007, and is projected to reach a maximum of 25% in the future. Hydrologic changes resulting from the urbanization of agricultural lands may result in increased flooding, channel erosion, and water quality impacts in the watershed. The Appoquinimink River is designated as a warm-water fishery and is subject to all water quality criteria specific to this designated use and those defined for general statewide water uses including aquatic life, water supply, and recreation. More than 30,000 acres drain into the Appoquinimink River, which is framed by tidal marshes that extend along its banks to the Delaware River. These wetlands are highly valued as habitat for waterfowl, shorebirds and other wildlife, and as spawning and nursery areas for fish and aquatic life. The Appoquinimink watershed is also home to many endangered species including the bald eagle, bog turtle, and different species of hawks. It also supports abundant wildlife including herons, egrets, kingfishers, osprey, swallows, otters, minks, beavers, deer, flying squirrels, meadow jumping mice, bats, and opossums. A Total Maximum Daily Load for nutrients and bacteria has been established for the Appoquinimink River requiring a 60% reduction in nitrogen and phosphorus loads and a bacteria reduction of between 11-15% in freshwater areas and 72-73% in marine areas. The Appoquinimink River Watershed has a total of ten sites listed in the Site Investigation and Restoration Section (SIRS) database. There are six sites that are state-fund lead (HSCA), two sites that have undergone a preliminary assessment / site inspection (PA/SI) and one site each in the Brownfield Program and the Voluntary Cleanup Program. Each of the sites is sampled through the programs listed above for a consistent suite of environmental contaminants. These contaminants are broadly classified as Volatile Organic Compounds (VOCs), Semi-Volatile Organic Compounds (SVOCs), Pesticides, Polychlorinated Biphenyls (PCBs) and Metals as listed using USEPA and DNREC defined standards. When sites are adjacent to water bodies, sediment samples are collected to assess potential impact from a site to the health of the waters. In water bodies of the Appoquinimink River Watershed, samples have indicated that DDT and dieldrin, PCBs and dioxins are present in the environment at levels requiring further attention under the Clean Water Act (1972). The Appoquinimink River Watershed is on the 303d list of impaired waters as well as having State of Delaware Fish Consumption Advisories for PCBs and dioxins. If you would like to view reports for any of the sites in the SIRS program please follow the link the DNREC Environmental Navigator to search by map for the Appoquinimink River Watershed. The topography is generally characterized by flat to gently sloping land which is typical of the coastal plain. The Appoquinimink River Association is actively involved in promoting, developing and engaging in educational activities and on-the-ground projects related to southern New Castle County watersheds including the Appoquinimink Watershed. Projects that the Association uses to educate the public include open space and riparian buffer reforestation, rain gardens, stream restorations, backyard habitats, and water quality testing. The Association has used this program to help several watershed communities and residents with maintaining their community's open space, riparian buffers, and stormwater management areas. The Appoquinimink River Association (ARA) has also established various outreach programs related to stormwater management. The Association gives presentations on water pollution education to many local students, government officials, homeowner associations and civic groups; creates educational newsletters; maintains an educational website; and attends local outreach events. Through the years, residents in the watershed have enjoyed the many recreational opportunities provided by the river, including boating, swimming and fishing.